Hundreds of years ago, the Sith Emperor ordered the construction of the Dark Temple as a burial place for his dead and defeated enemies, "to aid them in becoming one with the Force." Little is known of what rituals the Emperor performed there, but the Dark Temple has become a nexus of powerful dark side energy, and a place where ancient weapons and ancient secrets of the Sith lay sealed away in cavernous chambers. Although the Dark Temple grounds have always been a dangerous place for the weak-willed (the expansion of the Kaas City power grid into tunnels beneath the temple drove a thousand slaves mad), the temple itself remained sealed until recently, when an expedition of power-hungry Sith Lords and their servants breached the gateway. The Dark Council did not sanction this intrusion, nor did it punish the rogue Sith; no one returned from the expedition to punish. Violent electrical storms surrounded the temple for the first week after it was opened, and since then, additional expeditions have been sent by the council to determine the temple's status. Their reports have not been made public. The estate of the rogue Sith Lord Grathan is a miniature fortress, reinforced by cutting-edge weapons technology and experimental shielding. Lord Grathan's cadre of scientists are constantly upgrading the defenses to ensure that air strikes fail to do harm--only ground-based attacks can do real damage. It's the perfect place for a rogue Sith Lord to make his stand. Lord Grathan has been reinforcing his territory and adding sublevels to his manor for years, suggesting that his plan to declare himself the thirteenth Dark Council member has been in progress longer than many assume. Any number of traps and treasures may exist deep underground, guarded by Grathan's personal guards and automated war droids. Behind the Sith and the powerful Imperial military is the vast network of agents, information gatherers, deception specialists and strategists that makes up Imperial Intelligence. Part spy organization, part secret police, Imperial Intelligence handles all of the Empire's covert operations--guarding the Empire's secrets, acquiring valuable intel from the Republic, hunting down traitors and cleaning up messes created by unhinged Sith Lords. Imperial Intelligence reports to the Minister of Intelligence, who in turn reports directly to the Dark Council. Not a military organization, Imperial Intelligence officers are nonetheless viewed with respect by military and civilian personnel--it's Intelligence that can judge a person as loyal or traitorous, arrange the advancement of a career or the blacklisting of a powerful leader. A place in Imperial Intelligence is a coveted rank, reserved for some of the best of the Empire's non-Force sensitive subjects. In some cases, officers are "poached" by Sith Lords seeking to build their own specialized intelligence networks; for the most part, however, Intelligence personnel go unnoticed by anyone outside the organization. The best agents are the ones no one's ever heard of. The capital city of the Imperial homeworld of Dromund Kaas is one part massive skyscrapers and one part impenetrable fortress. It is host to the Citadel, where the Sith of the Dark Council (and those who aspire to the Dark Council) lord over their followers, and the headquarters of the Imperial military and Imperial Intelligence. Kaas City was founded by the first Sith to arrive on Dromund Kaas, who saw the gorges and ravines of the jungle world as the perfect place to build their eternal sanctuary. Over the following centuries, its population grew into the millions--proud Imperials working toward the glory of the Sith and slaves submitting to Imperial will. Kaas City is also where the Emperor is believed to make his home, keeping a watchful eye on his Empire. Outsiders in Sith society, followers of the philosophies of the mysterious Darth Revan meet in a hidden enclave in the jungles of Dromund Kaas, submitting any who want to join them to rigorous tests to establish their loyalty and sincerity. Originally, the Revanites met in Kaas City to study Revan's teachings, but as suspicions arose about the Revanites' loyalties to the Emperor and the Dark Council, they were forced to conceal their activities. At first, they took shelter in the compound of a prominent Sith Lord, but when that Sith was assassinated (presumably for supporting the Revanites), they were forced to relocate their sacred texts and relics and build their sanctuary in the jungle. Revanites inside the Imperial military and the Sith have kept the compound from appearing on most scans of the area. Explorers who stumble upon the compound are rarely heard from again. The Citadel stands at the heart of Kaas City, a monument to the Sith Empire's strength and home to its most powerful Dark Lords. The Ministries of War, Intelligence and Logistics are all headquartered here, along with a Mandalorian enclave. The Emperor's Dark Council gathers to meet in the Citadel when not on the Sith holy world of Korriban. The original Citadel mimicked the designs of Korriban's Sith Academy and the Great Citadel on Ziost, but it was destroyed four hundred years ago when two members of the Dark Council fought an ancient Sith duel, called the Kaggath, on its grounds. The duel was a draw, and both of the combatants were executed by the remaining Dark Council members, who oversaw the rebuilding of the Citadel in its current form. The most recent architectural addition to the Citadel, the Mandalorian enclave is reserved for the Empire's allies among the mercenary Mandalorian warrior clans. Although it may appear to be a simple embassy from the outside, the proceedings inside are anything but diplomatic. The enclave is a place where new warriors come to test themselves against the Mandalorians and compete in violent (and often deadly) tournaments, as well as where the best among the Mandalorians help plan the Empire's next strikes. The Sith Sanctum is the heart of the Sith Order on Dromund Kaas, where lords gather and where the Dark Council meets when not on the Imperial burial world of Korriban. The Emperor himself is believed to have chambers in the sanctum's lower levels, though none save the council and the Imperial Guard are allowed into its depths. The original Citadel, like the Sith Academy on Korriban, was off-limits to everyone but the Sith. After the Citadel was rebuilt, the headquarters of the three Imperial ministries were added; more recently, the Mandalorian enclave was given a wing within the sprawling building. As a result, chambers in the Sith Sanctum have become an increased source of conflict and backstabbing among aspiring Sith. 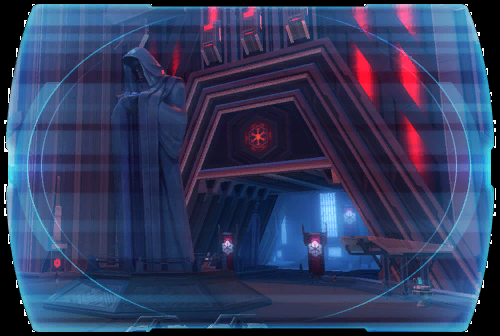 A place in the Sith Sanctum signifies aspirations to the Dark Council, or a prominent role in the direct governing of Dromund Kaas. A massive, unfinished statue towering over the jungles of Dromund Kaas, the colossus was the project of Dark Council member Darth Vowrawn's ambitious apprentice, Lord Qet. In a bid to advance in prestige within the Sith Order, Lord Qet commissioned the construction of the colossus--a statue of his master--in secret, bringing in offworld slaves to do the work. The slaves rebelled, and now the colossus stands unfinished while the slaves search for a way to destroy it and win their freedom through force. Lord Qet has been trying to end the rebellion and finish the colossus, but other Sith Lords have seen the chaos as an opportunity to advance their own reputations in the Empire. When the Sith discovered Dromund Kaas, it was an untamed jungle world, uninhabited by any sentient species. Over centuries, gleaming and orderly Imperial cities have spread to cover most of the planet, but stretches of harsh, untamed wilderness remain. Populated by violent predators such as the gundark and jurgoran, the wilds separate Kaas City from its spaceport and are best navigated at a safe distance, by speeder, rather than on foot. Dromund Kaas is the capital of the Sith Empire, founded a millennium ago in the aftermath of the Great Hyperspace War. Since then, the sleek metropolis of Kaas City has grown into a symbol of Imperial power, towering over the surrounding jungle and looming dark against the stormy skies. The military and the Sith have authority here, under the eye of the Emperor himself. Aside from the wildlife, the greatest threats are internal--slave revolts, feuding Sith Lords and the like. Planetary defenses are formidable, as the Empire still remembers its defeat and exile long ago.